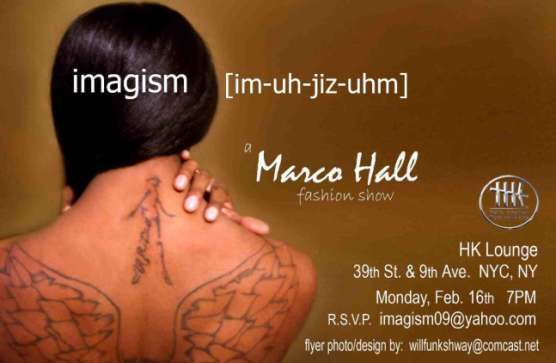 Fashion designer Marco Hall, one of New York's most exciting, creative and cutting edge new designers will showcase his latest creations on February 16th at New York's H.K. Lounge, 523 9th Avenue, at 7PM during fashion week. Come experience IMAGISM: movement; the expression of ideas and emotions through clear precise images. Hall infuses earth tones of chocolate, beige, tan and some black with pops of color. The carefully chosen textiles include khakis and suede and mixed with knits and hand painted fabrics to create a unique collection Hall describes as "My Indian Summer"." Marco's wears are featured in this month's Paris Vogue in the three page story about muse and personality, Andre J., wearing all Marco Hall designs. Hall has dressed and designed for Patricia Field, Alicia Keys, Erykah Badu, Kim Catrell, Mya and Rihanna, just to name a few. His work has also been featured on the cover of Vibe Vixen and Kitten and the pages of Ebony, Cut, Sew & Blog, NBC's "Kath and Kim" show and on the upcoming new season of Bravo's "Make me a supermodel". Marco's original and imaginative pieces can now be found at Patricia Field's Boutique on the Bowery in New York City. This new collection promises inspired silhouettes influenced by music and art, but most importantly the spirit, energy and style of the people he adores. "There's nothing greater then being yourself and loving you, individuality rules!" says Hall. Show starts promptly at 7:00 pm, Monday, February 16th at H.K. Lounge, 523 9th Avenue at 39th street. Marco Hall is a self-taught designer originally from New Jersey. His creative silhouettes wrap and drape the body of the woman or man who dares to be different and individual. Hall's designs combine color, cut, fit and spirit. He makes each piece with a couture technique that embraces the personal style and flare of each individual wearer.